Once upon a time, when I nervously signed the mortgage for my first house, I didn't rush to Pottery Barn or Crate and Barrel. Drapes that puddled perfectly on the floor or bird cages filled with plastic plants or funky plates with funky linens weren't on my wish list to make my new house homey. Instead, I spent every bit of disposable income supporting local nurseries. Honestly, is there anything nicer than a just-picked, fresh-from-the-garden, cheerful bouquet of flowers to make a home feel warm and vibrant? No. No, there's not. Well, OK, kids and significant others and furry babies are also high up on the list, too. The smell of apple pie baking also helps. Still, flowers will always be right up there in their ability to make a blah Wednesday feel like a celebration. Plus, as much as I love fresh flowers in our home, I love sharing them even more. It's pure happiness to watch a friend receive a bouquet, because flowers make every day a little brighter. Lately, though, I've spent more time obsessing about growing edibles to feed my family than remembering why I originally loved gardening. Plus, it's November. The garden looks...uninspiring. It's easy to snip some tulips in spring or arrange tea roses in summer. In fact, I planned a cutting garden for spring and fall blooms, which you can read about here. In fall, though, my attention turns to seed catalogs and bulb orders. I know it's trendy to proclaim fall as everyone's favorite season, but for me? Nope. No, thank you. Bring back my sunshine and pretty spring blooms, pronto. So, when the fearless leader of You Can Grow That!, C.L. 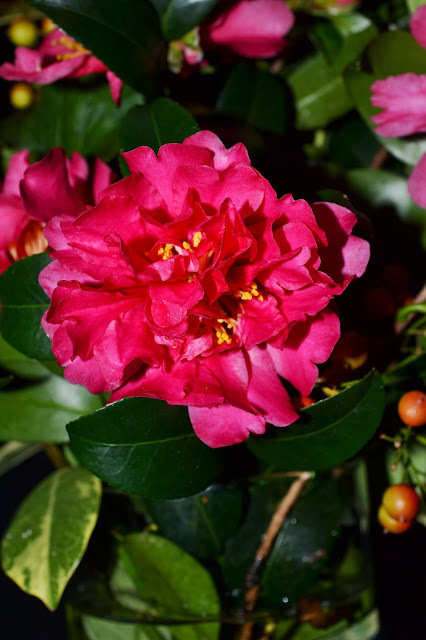 Fornari, challenged our group of garden bloggers to write about giveaway bouquets, I pushed aside my seasonal affective disorder and took a stroll around the garden to see if I could find anything--anything remotely attractive or alive--that would contribute to a bouquet. Surprisingly, I returned with arms full of material. Our camellias, hidden on the south side of the house, are heavy with blooms right now. Sadly, I tend to forget about them, because they aren't along the path I normally take to the kitchen garden. I plan to propagate some of these beauties and plant them in a more visible section of the garden, because they are the perfect fall flower. The viburnum, however, continues to produce a spectacular, eye-catching show all fall. 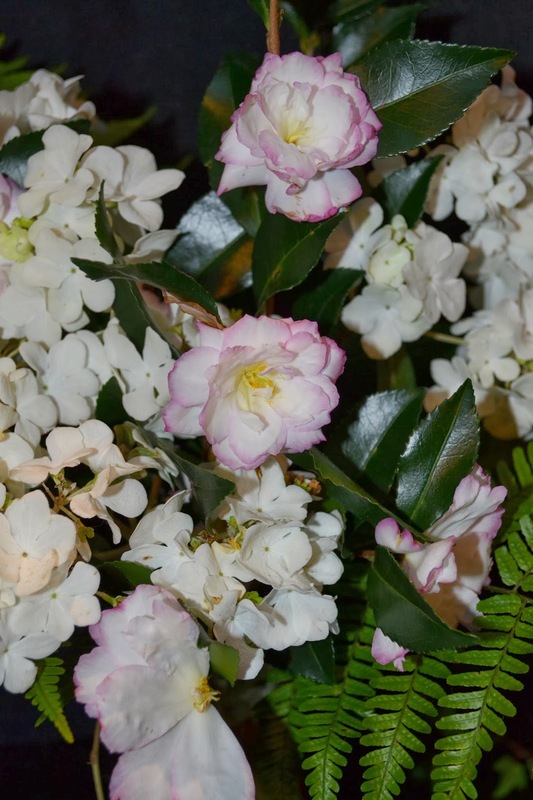 During spring, these two bushes brighten the back garden with their enormous blooms. While fall blooms aren't nearly as prolific, I still found plenty of flowers, although they were beginning to look a bit tired. 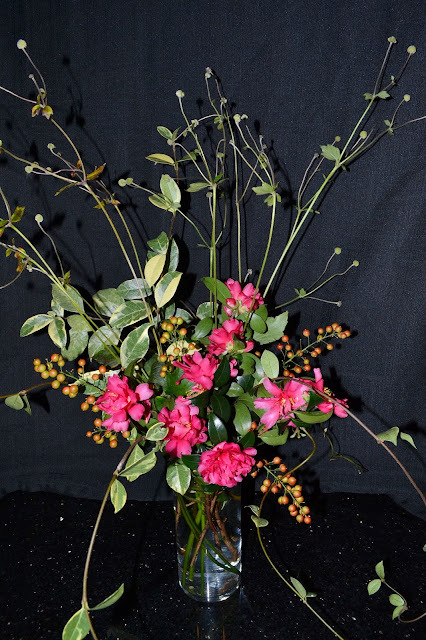 Because blooms are scarce during November, foliage needed to play an important part of the bouquet design. Fortunately, we have lots of variegated vines, hostas, and ferns. 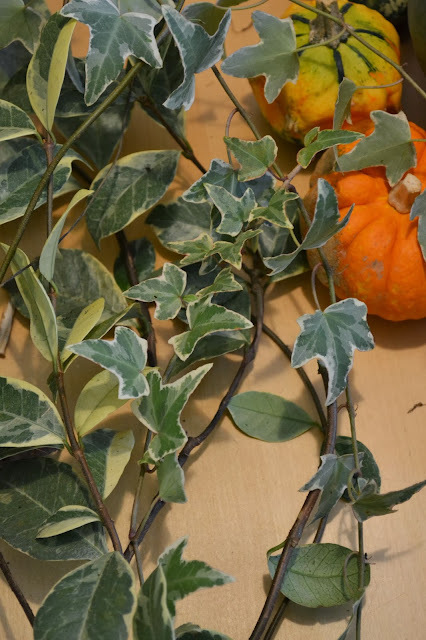 Even 'Gold Dust' aucuba participated in the November bouquet project. Herbs and berries also made an appearance in the bouquets. While I intended to use bronze fennel, some little creature had eaten most of it. Instead, the airy branches of Florence fennel added a frothy texture, as well as height, to an arrangement. Encore azaleas, a bloom that I never considered for bouquets prior to our assignment, was also added to the mix. 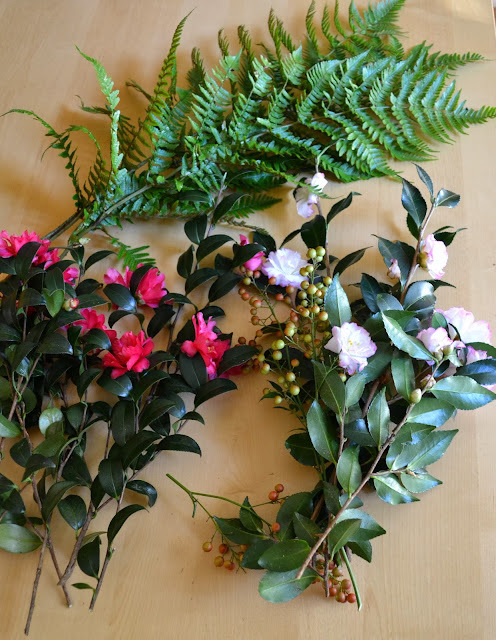 After I cleaned the foliage from the bottom portion of the stems and sorted the cuttings, I realized that I'd gathered enough materials to make not one but three bouquets. Pale pink camellias, viburnum, autumn ferns and variegated ivy. 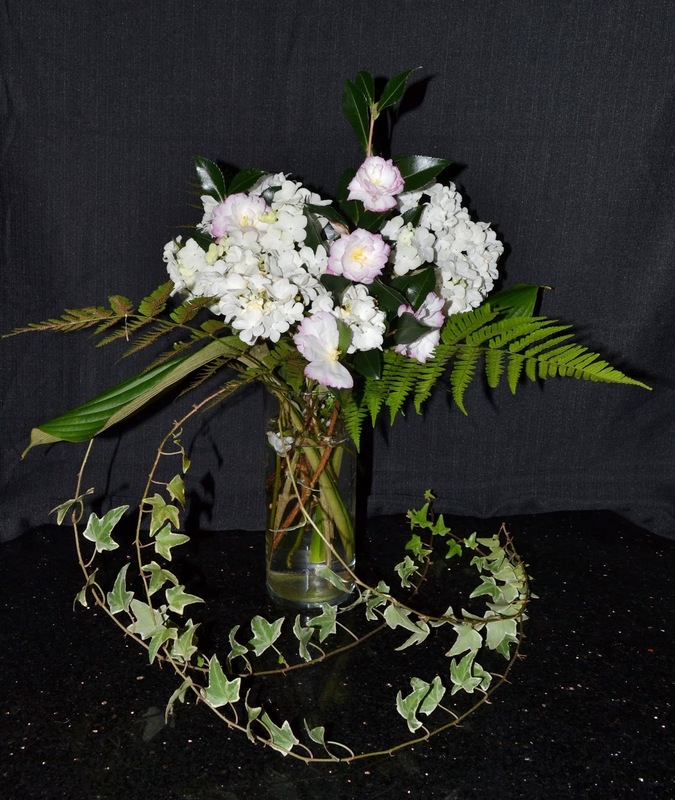 Seed heads from Japanese anemone, camellias, Hearts-A-Bustin' berries, and variegated potato vine. 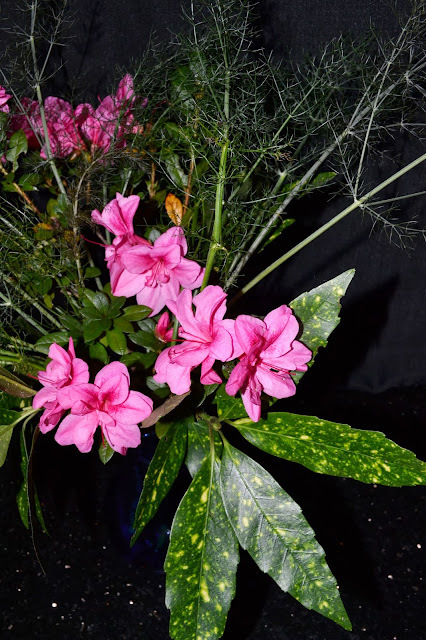 Encore azalea blooms, 'Gold Dust' aucuba, and Florence fennel. My bouquet making skills need more practice, but it inspired me to remember my first garden and the passion I had--for flowers. Of course, I'll continue obsessing about our edible gardens and native plants, but I'll also keep searching throughout all seasons to bring the garden inside and share it with friends. What flowers do you enjoy receiving in your favorite bouquets?